Vacancy in NABARD Recruitment 2018 Apply Online www.nabard.org 69 Development Assistant & Assistant Manager (P&SS) Posts Jobs Career Notification Advertisement on August 2018 www.nabard.org Career, Latest Job Opening at National Bank for Agriculture and Rural Development (NABARD) Recruitment 2018 Apply Online Application Form Download, Latest Jobs Notification for 69 Development Assistant & Assistant Manager (P&SS) Posts Vacancy in NABARD Recruitment 2018. Latest Jobs Career Vacancy in NABARD Recruitment 2018. Advt. No. 2/Grade A/2018-19 and 3/DA/2018-19. National Bank for Agriculture and Rural Development (NABARD) Recruitment 2018 www.nabard.org official website published a new Jobs Circular notification for 69 Development Assistant & Assistant Manager (P&SS) Posts vacancy on August 2018. Latest Jobs Career Opportunities in NABARD Recruitment 2018. Latest Govt. Jobs in National Bank for Agriculture and Rural Development (NABARD) 2018 www.nabard.org Career Recruitment news, 69 Development Assistant & Assistant Manager (P&SS) Posts Vacancy in NABARD Recruitment Notification Apply Online Application Form. NABARD Recruitment News for Development Assistant & Assistant Manager (P&SS) Posts . Eligible candidates may Apply Online from 27th August, 2018 to 12th September, 2018 (www.nabard.org Career). Further details of Vacancy in NABARD Recruitment 2018 for Development Assistant & Assistant Manager (P&SS) Posts – Age, pay Scale, Eligibility Criteria, How to Apply & other details on Mentioned below. At the instance of Government of India Reserve Bank of India (RBI), constituted a committee to review the arrangements for institutional credit for agriculture and rural development (CRAFICARD) on 30 March 1979, under the Chairmanship of Shri B.Sivaraman, former member of Planning Commission, Government of India to review the arrangements for institutional credit for agriculture and rural development. Many Job Seekers are waiting for NABARD Recruitment Notification Advertisement 2018 www.nabard.org, Finally your dreams come true, on this week of August 2018 National Bank for Agriculture and Rural Development (NABARD) published Notification Advertisement for 69 Development Assistant & Assistant Manager (P&SS) posts , Here You Can Find details Vacancy, Age Limit, Salary & how to apply for this job at NABARD on below. Name of the Recruitment /Organization Authority : National Bank for Agriculture and Rural Development (NABARD). Name of the Posts : Development Assistant & Assistant Manager (P&SS). Advt . Date : 27th August, 2018. Stating Date For Apply Online : 27th August, 2018. Last Date For Payment of Application Fee : 12th September, 2018. Development Assistant 62 Rs.14,650 per month (including two advance increments) in the scale of Rs.13,150 -750 -15,400 – 900 -19,000 -1200-26,200 -1300-28,800-1480-33,240 -1750 -34,990 (20 years) and other allowances, viz. Dearness Allowance, House Rent Allowance, City Compensatory Allowance, Transport Allowance etc. Development Assistant : Minimum – 18 Years to Maximum – 35 Years. Assistant Manager (P&SS) : Minimum – 25 Years to Maximum – 40 Years. Qualification Details For Development Assistant Post : Bachelor’s Degree in any discipline from a recognised University/Institutions with a minimum of 50% marks in aggregate (pass class for SC/ST/PWBD candidates). Qualification Details For Assistant Manager (P&SS) Post : He / She should be an Officer with a minimum of five years’ of Commissioned Service in the Army/ Navy/ Air Force holding a valid Ex-Serviceman Identity Card. STEP 1 : Logon to http://ibps.sifyitest.com/nabardaaug18 and http://ibps.sifyitest.com/nabarpsaug18 (Apply Online Link). National Bank for Agriculture and Rural Development (NABARD) 2018, Admit card / Hall ticket can be download from NABARD official website (www.nabard.org) before 10th days for the exam. Details are available on official website. Vacancy in NABARD Recruitment 2018 Apply Online www.nabard.org 21 Specialist Officers Posts Jobs Career Notification Advertisement on June 2018 www.nabard.org Career, Latest Job Opening at National Bank for Agriculture and Rural Development (NABARD) Recruitment 2018 Apply Online Application Form Download, Latest Jobs Notification for 21 Specialist Officers Posts Vacancy in NABARD Recruitment 2018. Latest Jobs Career Vacancy in NABARD Recruitment 2018. National Bank for Agriculture and Rural Development (NABARD) Recruitment 2018 www.nabard.org official website published a new Jobs Circular notification for 21 Specialist Officers Posts vacancy on June 2018. Latest Jobs Career Opportunities in NABARD Recruitment 2018. Latest Govt. Jobs in National Bank for Agriculture and Rural Development (NABARD) 2018 www.nabard.org Career Recruitment news, 21 Specialist Officers Posts Vacancy in NABARD Recruitment Notification Apply Online Application Form. NABARD Recruitment News for Specialist Officers Posts . Eligible candidates may Apply Online from 14th June. 2018 to 05th July. 2018 (www.nabard.org Career). Further details of Vacancy in NABARD Recruitment 2018 for Specialist Officers Posts – Age, pay Scale, Eligibility Criteria, How to Apply & other details on Mentioned below. Many Job Seekers are waiting for NABARD Recruitment Notification Advertisement 2018 www.nabard.org, Finally your dreams come true, on this week of June 2018 National Bank for Agriculture and Rural Development (NABARD) published Notification Advertisement for 21 Specialist Officers posts , Here You Can Find details Vacancy, Age Limit, Salary & how to apply for this job at NABARD on below. Advt. Date : 14th June. 2018. Commencement of on-line registration of application : 14th June. 2018. Closure of registration of application : 05th July. 2018. Closure for editing application details : 05th July. 2018. Last date for printing your application : 20th July. 2018. Online Fee Payment : 14th July. 2018 to 05th July. 2018. 1. Chief Technology Officer 01 Rs. 3.25 lakhs per month. 2. Senior Advisor 01 Rs. 1.45 Lakhs per month. 3. Chief Risk Manager 01 Rs. 1.45 Lakhs per month. 4. Project Manager 03 Rs. 1.05 Lakh per month. 5. Assistant Project Manager Storage, Marketing & Processing 01 Rs. 0.77 Lakh per month. 6. Assistant Project Manager, Climate change Adaptation 01 Rs. 0.77 Lakh per month. 7. Assistant Project Manager, Renewable energy 01 Rs. 0.77 Lakh per month. 8. Assistant Project Manager, MIS & Reports 01 Rs. 0.77 Lakh per month. 9. Risk Managers 06 Rs. 1.05 Lakh per month. 10. Senior Project Finance Manager 01 Rs. 1.05 Lakh per month. 11. Project Finance Manager (Infrastructure projects) 01 Rs. 1.05 Lakh per month. 12. Specialist Officer (Legal Aspects) 01 Rs. 0.77 Lakh per month. 13. Communication Professionals 02 Rs. 0.77 Lakh per month. Chief Technology Officer Passed First class in 4 years B.E./ B. Tech degree from recognized University/ Institutes. Senior Advisor Passed Graduation from any recognized university preferably in information technology. Chief Risk Manager Passed Post- Graduation/ Masters in Management from one of the top institutes (excluding online or distant) or CA/ CS. Project Manager Passed Graduation from any recognized university with minimum 05-year’ experience in project management. Assistant Project Manager Storage, Marketing & Processing Passed Graduation/PG, Doctorate in Food Technology /Food Engineering/ Food Processing. Assistant Project Manager, MIS & Reports Passed B.Tech in Computer Science or B.Sc in computers or MCA or equivalent course. Risk Managers Passed Post Graduation in Economics/ Statistics/ Finance/ MBA from a recognized university. Senior Project Finance Manager Passed CA/ MBA (Finance), B.Tech/ BE with MBA Finance. For Above Posts Candidates can apply through online mode. Online application till open 14th June. 2018 to 05th July. 2018. STEP 1 : Logon to http://ibps.sifyitest.com/nabarccjun18/ (Apply Online Link). Candidates Can Pay The Fee of Rs. 500/- For General Candidates and Rs. 50 For SC/ST. The Fee Can be submitted through Online. 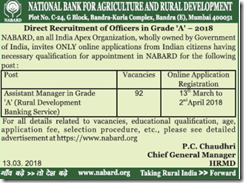 Vacancy in NABARD Recruitment 2018 Apply Online www.nabard.org 92 Assistant Manager RDBS Posts Jobs Career Notification Advertisement on March 2018 www.nabard.org Career, Latest Jobs Opening at National Bank for Agriculture and Rural Development (NABARD) Recruitment 2018 Apply Online Application Form Download, Latest Jobs Notification for 92 Assistant Manager RDBS Posts Vacancy in NABARD Recruitment 2018. Latest Jobs Career Vacancy in NABARD Recruitment 2018. National Bank for Agriculture and Rural Development (NABARD) Recruitment 2018 www.nabard.org official website published a new Jobs Circular notification for 92 Assistant Manager RDBS Posts vacancy on March 2018. Latest Jobs Career Opportunities in NABARD Recruitment 2018. Latest Govt. Jobs in National Bank for Agriculture and Rural Development (NABARD) 2018 www.nabard.org Career Recruitment news, 92 Assistant Manager RDBS Posts Vacancy in NABARD Recruitment Notification Apply Online Application Form. NABARD Recruitment News for Assistant Manager RDBS Posts . Eligible candidates may Apply Online from 13th Mar. 2018 to 04th Apr. 2018 (www.nabard.org Career). Further details of Vacancy in NABARD Recruitment 2018 for Assistant Manager RDBS Posts – Age, pay Scale, Eligibility Criteria, How to Apply & other details on Mentioned below. Many Job Seekers are waiting for NABARD Recruitment Notification Advertisement 2018 www.nabard.org, Finally your dreams come true, on this week of March 2018 National Bank for Agriculture and Rural Development (NABARD) published Notification Advertisement for 92 Assistant Manager RDBS posts , Here You Can Find details Vacancy, Age Limit, Salary & how to apply for this job at NABARD on below. Advt. Date : 13th Mar. 2018. Stating Date For Apply Online : 13th Mar. 2018. Closing Date For Apply Online : 04th Apr. 2018. 1. Assistant Manager (Grade ‘A’) – Rural Development Banking Services (RDBS) 92 Check The Advt. Qualification Details For Assistant Manager (Grade ‘A’) – Rural Development Banking Services (RDBS) Post : Passed Bachelor’s Degree in any subject from a recognized University with a minimum of 50% marks (SC/ST/PWD applicants 45%) in aggregate or Post Graduate degree with a minimum of 50% marks (SC/ST/PWD applicants 45%) in aggregate or Ph.D (OR) Chartered Accountant /Cost Accountant / Company Secretary with Bachelor’s degree (OR) Two year full time P.G. Diploma in Management / full time MBA degree from institutions recognized by GOI / UGC with Bachelor’s Degree in any discipline. For Above Posts Candidates can apply through online mode. Online application till open 13th Mar. 2018 to 04th Apr. 2018. STEP 1 : Logon to https://www.nabard.org/careers-notices.aspx?cid=545&id=26 (Apply Online Link).